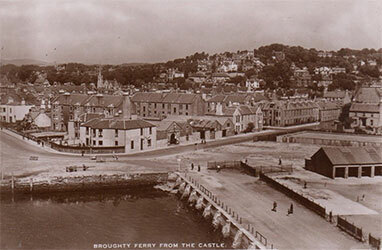 is a lovely little town on the coast, just to the east, and nowadays part of, Dundee. 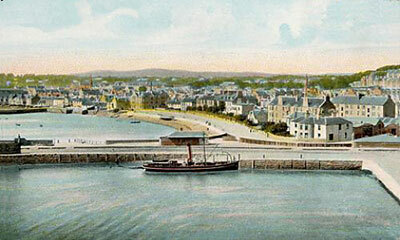 As far as towns go, it can be termed a new town as 200 hundred years ago there was nothing there but sand and sea. 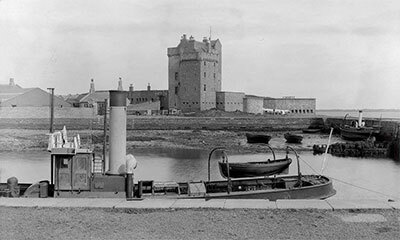 Nearly nothing anyway, there was Broughty Castle which dates way back to 1454 and North Ferry probably goes back further as a small group of fisherman's houses beside a good fishing location. Mentions of early Hunters moving into that area include the will of John Hunter of Baldovie, who died Jan. 1st, 1667, a descendant of the Forfar and Burnside family. They obviously liked the area as David Hunter, 2nd Laird of Burnside, and his son David, younger of Burnside bought Balgillo and the lands of North ferry including fishing rights in 1666. 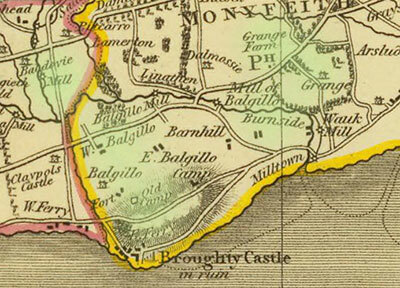 David the 3rd Laird of Burnside is known to have lived for a time at the Burnside in the Parish of Monifieth, possibly part of the Balgillo estate which was quite extensive. The 7th Laird (Jacobite) added the Grange to the portfolio whether to impress his "posh" new wife, or to secrete his comings and goings? 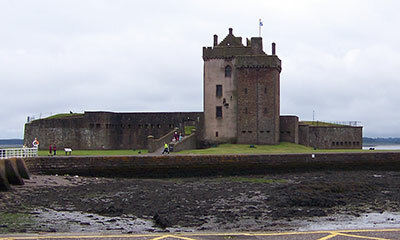 General David Hunter, the 9th Laird had big ideas for Broughty. 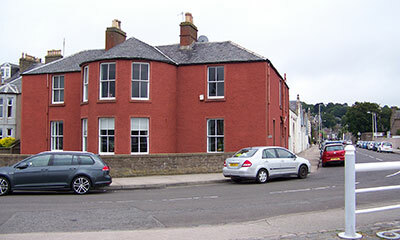 It had been owned by the family for 130 years and although the fishing rights were a good earner, he wanted to do more. In 1801 published his plans and started work. If I can quote Alexander J. 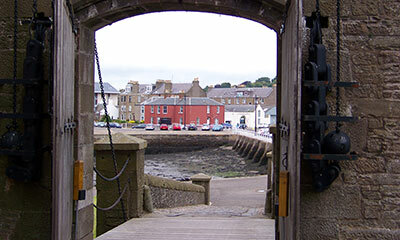 Warden, author of national reknown and local resident, who wrote in 1880: "General Hunter built a marine villa for himself fronting the river, close by what is now the railway pier and station, and some other Angus lairds built residences in the vicinity of the General. The architect who drew out the plans for the proposed village had been a man of enlightened foresight; and the intelligence and wisdom of the proprietor who adopted and carried out the plan in feuing the ground is worthy of commendation. The streets, which extend from one end of what was the village to the other end, in a straight line, are spacious even according to modern ideas. These were crossed at right angles by others, equally spacious, running north and south. For many years the streets were only partially bounded by buildings, but of late years, few stances remain unoccupied in the leading streets, and some of the houses are handsome structures". Everything seemed to be going well and David brought out new plans in 1825. 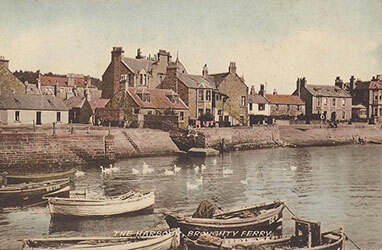 The first plan had been to populate the vacant land between the west end, (West Ferry) and the east end which is Broughty Ferry proper, with a mixture of housing and commercial premises. Set out military style, in a grid pattern. 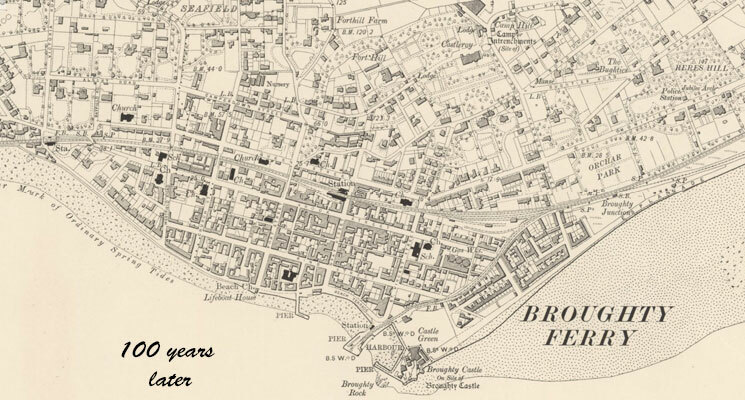 The second plan was for grand avenues and crescents similar to what was happening in Edinburgh and Bath at that time. Allowing space for mansions and sweeping gardens. The railways came next and was to be a mixed blessing. Around 1835 the main line from Edinburgh to Aberdeen was through Perth, but the most direct would be through Fife and crossing to Dundee. 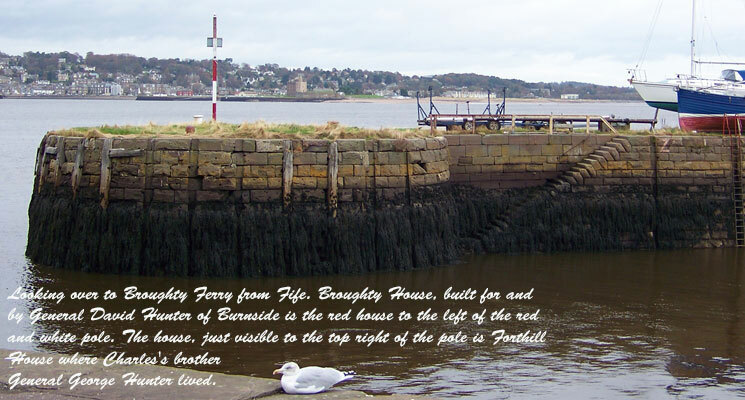 The narrowest part of the Firth of Tay was at Broughty. 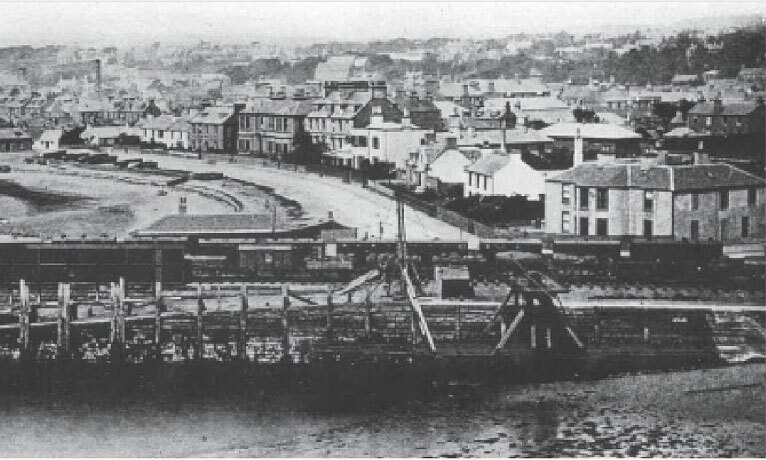 While discussions on a rail bridge were being considered a brand new "invention" the Rail-Ferry was used. The Railways had the power of Parliament behind them and went where they wanted. 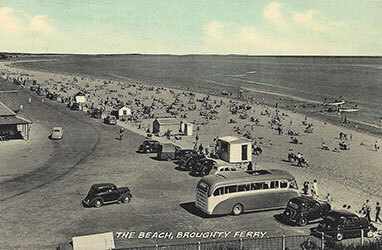 They drove a track right through Broughty which scuppered the Geberal's avenues idea a bit and in Barry they even put a track right through the middle of the Hunters of Blackness's golf course. However it brought it brought in more day-trippers for a trip to the sea-side and made it even more desirable to the rich. Seen as a refuge away from the hustle and bustle of a busy Dundee. Quite a few new super-plots were built on by the new aristocracy "The Jute Barons". and today is over 13,000. 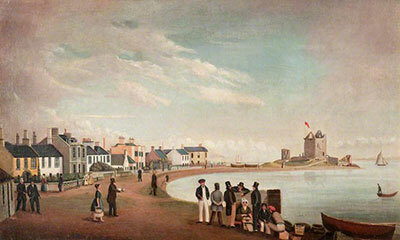 About 1780 the white fishing on this coast began to decline. 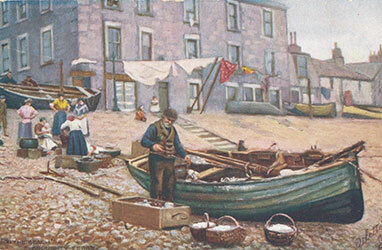 Haddocks, which were caught in greatest abundance, totally left the coast, and for a number of years none were caught. The only fish caught during that period were ling and cod, and a few of other sorts. When the report was written, 1792-3, the haddocks had begun to make their appearance again, but only in small quantities. There were doubts about the cause of the disappearance of the haddocks, whether for lack of food, or because they had been pursued by some voracious enemy. Porpoises, or gair-fish as they were then called, were very numerous, and very destructive to the salmon. They may have disturbed and frightened the haddocks. 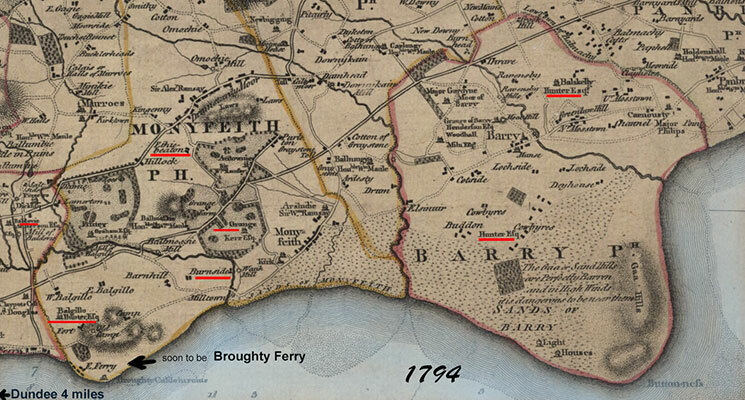 The old Account also says — There were three villages in the parish, which were thus peopled — Drumsturdy Moor, 134; Monifieth, 175; and the Ferry, 250. The total population in the parish, of all ages, was 1218 persons, and it appears that at no former period was it greater than then. Great changes have taken place in the parish since 1793, when the account was penned. The parish, in common with most of the others in the county, had in many respects been in a very backward state up to nearly the end of the first half of last century. 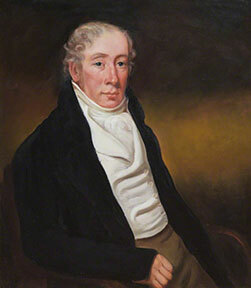 The account given in the old Statistical Report regarding the improvements in its agriculture by Mr Hunter, the proprietor of several lands in the parish shows the state in which it had previously been. The report very properly says that he is a gentleman whose name deserves to be recorded, as it was entirely owing to his enlightened spirit that the change on the face of the parish had been made. Some years before 1750 he began to enclose land, and betwixt 1750 and 1752 began to use lime as a manure. In 1753 he introduced the culture of turnips, and in the following year that of potatoes. By fallow, dung, and lime he prepared his grounds for the crop, and he sowed them at the proper season with grass seeds. Now that his fields began to assume a fairer surface and a softer mould; but still their unpleasing form remained. The ridges were wide at one end, narrow at the other, and bent in various curvatures. They were soon rendered regular and straight. His fields lay beside the road to the Parish Church, and the parishioners as they passed beheld their beauty and fertility with wonder. What they beheld they imitated, and many soon saw with satisfaction their own fields covered with a similar beauty and fertility. The old Scottish ploughs were dismissed apace, and there was not then one in the parish. The old Account of Monifieth parish and village says : — As their situation is so salubrious, that multitudes resort every summer to the villages of the East and West Ferry for the benefit of sea-bathing, as the employments of few are sedentary, as the ground is nowhere marshy, as the access to coals is easy, the people are generally healthy. But it is of more importance to characterize the minds than the bodies of a people; it is of more importance to be told that, within the last 80 or 90 years, the parish has increased as much in religion and morals as in the arts of life, &c.
Steamboats still brought in the visitors until the second rail bridge was finished and public confidence was re-gained.